Learn basic, intermediate, and advanced tennis strokes through photo-illustrated, step-by-step instructions. This is the easiest forehand, but many players use essentially the same style at the advanced level. 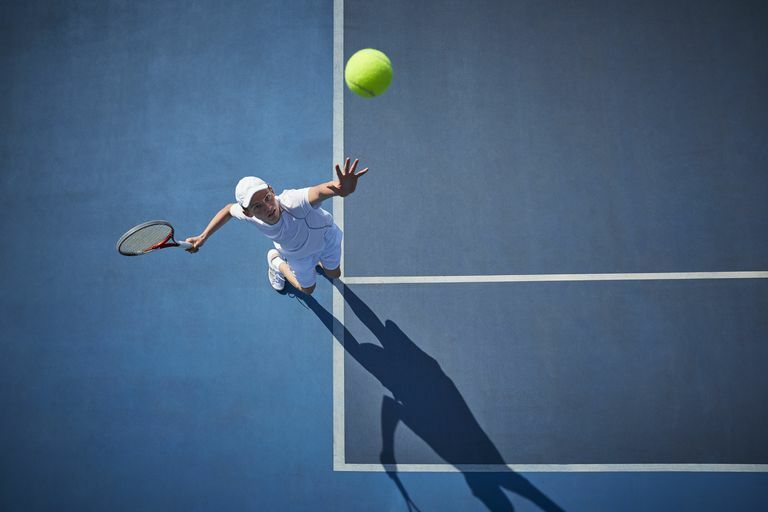 Most people find this the easier backhand to learn, because it resembles a forehand, gains stability from the support of two hands, and allows a slightly later swing. Some find the one-handed backhand immediately more comfortable than the two-hander, even if it takes longer to master. The one-hander also has the advantage of more reach and versatility. This basic serve has every element of an advanced serve except intentional spin, which you will be able to add without any fundamental changes once you're ready. Simplicity is a great virtue in volleys, and this volley is as simple as any stroke gets. People love to practice the overhead, partly because it's like a serve--without the often troublesome toss. The choice of which forehand grip to use has a profound effect on your ability to hit particular spins and to meet the ball comfortably at a given height. Two-handed backhand grips don't determine your stroke options as much as do forehand grips, but understanding the grips and their implications can help you adjust for problems you're having with your stroke. The one-handed backhand grips vary within a relatively small range, but your choice of grip does have a strong bearing on where you should meet the ball and how easily you can generate particular spins. This is the favorite and most powerful forehand for many of the biggest hitters in tennis. It's also a great way to make up for a comparatively weak backhand. Every player, whether a one-hander or a two-hander, should have this shot. Its low, sideways skid has all kinds of tactical uses. If you were to average the grips and stances of all the forehands hit at the pro level, the result would be very close to this shot. It combines the linear energy of a classic, square-stance forehand with the rotational energy of the more recently emergent open stances. By far the most common first serve used at the advanced level, this serve's topspin component allows it to be hit extremely hard while still clearing the net by a reasonable margin. Players who have mastered the twist serve tend to use it for the vast majority of their second serves and sometimes for first serves as well. It clears the net with the generous margin of safety you want on a second serve, and then it kicks high and somewhat sideward, making it often difficult to return. A close cousin of the twist, the topspin serve is the easier of the two kick serves to produce, but it's also easier to return because it flies and bounces basically straight. This serve's almost pure sidespin makes it skid low and sharply sideways. It's a great change-up serve and one of the most effective and easiest serves to hit in heavy winds. When you have to meet a volley below the height of the net, the drop volley is often your best--and most fun--choice. Players often miss volleys at this height because they try to hit them as they would a higher ball. Medium-height volleys are a distinct and important skill. Given the typically fairly slow ball on which you'll use this volley, you'll usually swing harder than you would other backhand volleys. The backhand overhead has an undeserved reputation as "the most difficult shot in tennis." You're unlikely to hit it with the kind of power you would a standard overhead, but you'll probably find that you can master this shot well enough to put it away most of the time. Every intermediate and advanced player should cultivate a good drop shot. Against many opponents, it can be a decisive tactical tool. Topspin lobs are much more difficult to execute than flat lobs, but they're virtually impossible for an opponent to retrieve after the bounce, and they can be extremely effective in baseline rallies, too. The one-handed backhand topspin lob is more difficult to generate than the forehand topspin lob, but opponents will often prefer to attack your backhand as they approach the net, and if you own this shot, you can discourage them pretty quickly.